BONE CANCER is one of the uncommon cancer of all other types of cancers. Bone cancer generally affects the normal tissue of the bones and affects the working of bones. Bone cancer can be primary or secondary. Primary bone cancer begins within the bone whereas secondary bone cancer begins in other parts of the body and spread to nearby bones and affects them. Bone cancer may be malignant(fatal) or non-malignant. This mainly occurs in the long bones of the body particularly in arm bones and leg bones. The most common symptom of bone cancer if pain in joints. 1. 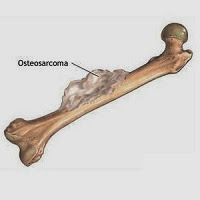 Osteosarcoma :- Osteosarcoma is is the most common bone cancer that mainly affects the age group of 5 to 20 years. It arises from a bone tissue named osteoid. It mainly occurs in long bones such as thigh bone and arm bone. It is the third most common cancer that develops in children after brain tumors and leukemia. 2. Chondrosarcoma :- This type of bone cancer mainly develops in adults of age group of 40 to 50 years. It mainly occurs in the cartilage tissue of bones. These mainly occurs in upper arms of body, shoulder, upper leg and between the hip bones known as pelvis. 3. Ewing sarcoma :- This type of bone cancer mainly occur in main bone area and also it can occur in the soft parts and tissues of body such as fibrous, muscle, fat tissues, blood vessels and other supporting tissues. This occurs in the young age group of 10 to 20 years of age. It mainly develops in backbone and pelvis. 4. Spindle cell sarcoma :- This type of bone cancer is likely to osteosarcoma which occurs in adult age group of age more that 40 years of age. It occurs in thigh bones and arm bones similar to osteosarcoma.